Prominent & Leading Exporter from Salem, we offer compass binoculars, clinometer compass, digital compass, pocket compass and electronic compass. 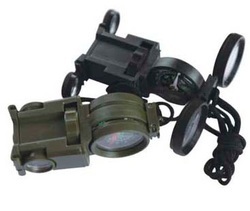 Function of the product: Binocular, magnifier, compass, and mirror. Best choice for camping and traveling. Cheap in price with top quality. The Handle Compass gets its name from its "handle" shaped sight, which actually serves two purposes: With the ambit level, an object can be viewed through the peep sights to determine its magnetic heading. Clinometer Handle Compass is a reproduction of a demode Clinometer compass. The second and most interesting purpose is when tilting the compass on its side and viewing an object through the sights, its angle of elevation or declination can be found. A weighted pendulous arm beneath the compass needle can be read from one of three scales: Angle in degrees beneath the zenith (from straight up), angle in degrees of elevation or declination, and in inches per yard of slope. The compass has a needle lift mechanism to protect the compass jewel and the pendulous arm when being transported. The Brunton Nomad V2 Digital Compass supplies you with time, temperature, and daily alarms. Full function time piece, declination adjustable, temperature in Cº or Fº. The Brunton Nomad V2 Digital Compass includes backlit digital display for use at night. Features forward bearing and bubble level for +/- 2° accuracy. Bruton's newest digital compass - the Brunton V2 Nomad - offers easy navigation with the push of a button. Find your way with the help of this forward- and reverse-bearing compass. Not only does it navigate, it informs. Get current temperature readings, time and date and daily alarms. The backlit display makes nighttime usage possible. Navigation is almost mystical. It is as complex as the sun or stars, or even time. Centuries ago, the compass changed the way we navigate, making it a more accurate process. And for more than 100 years, Brunton has continued to make the compass more precise, durable and versatile. Brunton has pioneered entire navigation systems for adventurers’ specific needs. 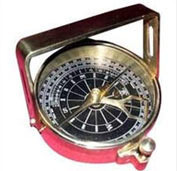 Still today, Brunton is the largest compass manufacturer in the world. Needless to say, they know navigation. They don’t just sell compasses, they build them. And each compass that comes from their line has been through the physician-like hands of a detail-minded team. Bruton builds navigational instruments that aid the military, help build bridges, educate our youth and show blind climbers the way up Everest. Because they know a compass is more than a tool, it’s a necessity. It’s an investment in safety. And a Brunton compass is more like a right of passage in life, the time when you truly become self-sufficient and understand what the outdoors are really about. 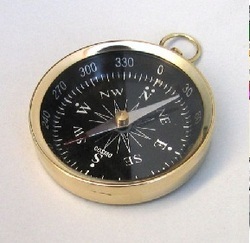 Solid brass working pocket compass. A must for every sailor or for the grandchild who sails with his grandpa or heads out to boy scout camp. 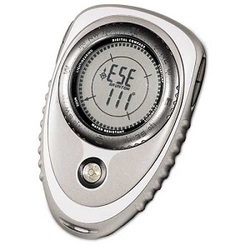 An electronic compass that stores bearings, times and courses. Accurate to 2° (1° resolution); unlike traditional compasses that must be held level, the Outback can be tilted up to 15° without compromising accuracy. Error flag warns when accuracy is being affected by magnetic interference. this compass features multi-leg, trail blazing, bearing mode, declination correction, night navigation, and a built-in timer and clock. Displays in digits and cardinal points. Water resistant to 10 ft.
Dimensions: 3.68" x 2.75" x 1.22". 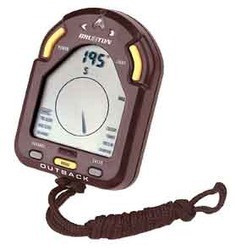 308-090 Outback Electronic Compass 0.5 lb.